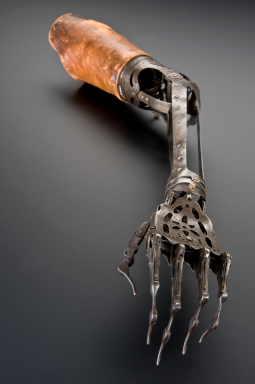 Made from steel and brass, this unusual prosthetic arm articulates in a number of ways. The elbow joint can be moved by releasing a spring, whereas the top joint of the wrist allows a degree of rotation and an up-and-down motion. The fingers can also curl up and straighten out. The leather upper arm piece is used to fix the prosthesis to the remaining upper arm. 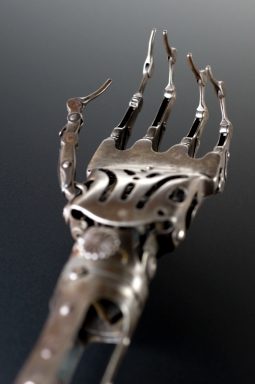 The rather sinister appearance of the hand suggests the wearer may have disguised it with a glove. 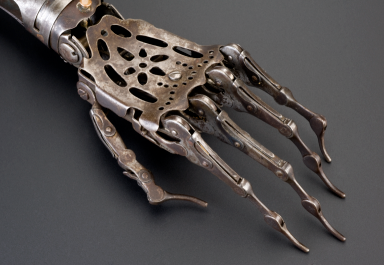 Among the most common causes of amputation throughout the 1800s were injuries received as a result of warfare. Disguise it with a glove?! Bah, it looks seriously badass. Seriously though, Goetz von Berlichingen (http://en.wikipedia.org/wiki/G%C3%B6tz_von_Berlichingen) predates that by at least 300 years.